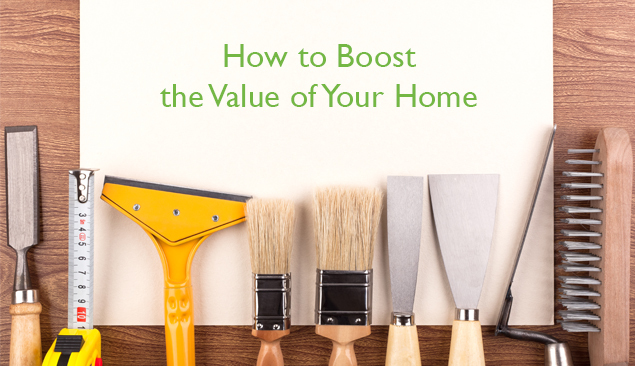 There are many ways to increase the value of your home, but if you’re planning to move home in the near future then you’re probably looking for the quick and easy ways to add value. Here are five suggestions for ways to increase the value of your home without breaking the bank. A relatively inexpensive way of adding value is to redecorate. A fresh coat of paint can do wonders for a property, particularly if the current décor is considered to be dated. A coat or two of a more neutral tone throughout the property can work wonders for both the value and ‘saleability’ of a property. We’re not talking about putting in a whole new kitchen here, as that can cost tens of thousands and you’re unlikely to see the value of your home increase by a similar amount. But there are some quick ways of improving what you already have. For example, it‘s relatively easy to replace the doors and worktops of your kitchen units with more up-to-date versions, lending a new, fresher look to the room. Also consider replacing the flooring if it is looking tired or worn. Take a long hard look at your carpets, if you have them. Are they clean or do they look like a herd of elephants have trampled over them daily for the last few years? Floor coverings are an important part of the overall look and feel of your home and, in good condition, can add value to your home. At the very least, pay for a professional carpet cleaner to come and give them a deep clean – you’ll be surprised at just how much better that can make them look. Alternatively, it might be worthwhile completely replacing them if they are very dirty or worn. While you don’t need to have a suburban version of Kew Gardens, there is value to be added by tidying up whatever garden space you have. Paint any tired looking woodwork and get rid of unused pots and clutter. Consider adding a few new plants in any bare spaces and, if you have an outdoor sitting area, invest in or borrow some quality garden furniture to show your buyers the potential for the outdoor space. We keep saying this but it’s because it’s true – the simplest and cheapest way to add value to your home is to declutter! Imagine a lovely spacious house with clean surfaces, minimal furniture and no clutter. Then imagine a house packed with papers, books, surfaces strewn with toys and clothes and other detritus. Which would you pay more for?